Home » Cervical Disc Replacement » What cervical artificial disc should I choose? What cervical artificial disc should I choose? In the cervical spine, the main reason that has led to design and implement surgical implantation of cervical artificial disc is to avoid adverse biomechanical effects on adjacent segments (adjacent cervical discs) which is one of the thing that can happen when having an anterior cervical disc fusion (ACDF). Biomechanical in vitro studies have shown that constructs including fusion of vertebral bodies can increase the movement of the adjacent segments and provoke adjacent disc tension. Clinically, it has been proven that over time, radiographic and clinical deterioration of adjacent cervical disks after a cervical fusion (ACDF) is about 2% to 3% annually and it is estimated that between 7% to 15% of patients with previous cervical fusions (ACDF) will require another operation on an adjacent level *. Therefore the cervical artificial disc replacement potentially reduces or even eliminates the effects of ACDF in adjacent levels due to maintaining motion. Biomechanical factors to be considered include the shape of the articular surfaces, their centers of rotation, and the subsequent effect that these factors can have on other parts of the cervical spine, including the facet joints. 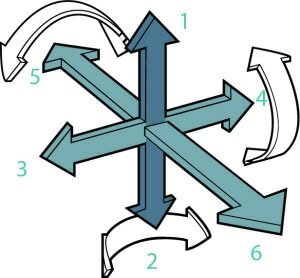 With respect to the materials that the disc prosthesis is made, special consideration should be given with regards to the composition of the part of the prosthesis that will be in contact with the cervical endplates, the method of attaching the implant to the bone and the materials used in the artificial disc moving parts (joint). Perhaps one of the most important aspects of the design of a cervical artificial disc is the understanding of the bony anatomy of the cervical vertebra, which is where the prosthesis is implanted. After anatomical studies, it is known that the most dense bone parts in the cervical vertebrae are the vertebral endplates sides. This higher bone density is partly caused by the higher bending loads and high lateral mobility observed in the cervical spine. In fact, bone density was found to be highest in the cervical spine than in the lumbar spine. So, based on these aspects, certain design properties are recommended: (1) the implant must have sufficient surface contact with the vertebral endplate to maximize the area of contact with the vertebral body, especially in areas of higher bone density: (2) the implant should have a design that preserves the uncovertebral joints. The normal movement of a natural cervical disc consists of a limited movement (constrain) in six areas: flexion, extension, rotation, compression, translation, and distraction. Although it would seem desirable to have an artificial disc with a high degree of mobility, biomechanical studies have shown that a certain restriction of movement is beneficial in the prevention of excessive load transmission to adjacent joints (spinal discs), especially posterior facet joints. That’s why we talk about semiconstrained movement. 1-Maintain or restore disc height and physiological curvature of the cervical spine. 2-Maintain or restore disc mobility. 3-Avoid long term degeneration of adjacent levels. Firstly, follow advices from your experienced surgeon. Currently there are many artificial vertebral discs on the market. The latest cervical artificial disc generations are those that allow movement in the 6 degrees of freedom explained before. It should be stressed that in the US, the FDA has approved the general use of cervical artificial disc replacement on one level and for two levels cases’, the only approved implant is Mobi-C (LDR). In Europe however, the CE has approved the use of different artificial discs at various levels, up to 4 levels in Europe. We use cervical artificial discs with 6 degrees of freedom such as M-6, Baguera and Mobi-C.
*Hilibrand AS, Carlson GD, Palumbo MA, et al.Radiculopathy and myelopathy at segments adjacent to the site of a previous anterior cervical arthrodesis. J Bone Joint Surg Am 1999;81:519–28.